In view of the strong breakers the laying of the stones was only possible from the dam crest. For this purpose a crane with a large range of reach was necessary. The outermost toe of slope, on which the stones had to be placed, was at a distance of 60 meters. The skip had a total weight of 66 t and, at the toe of slope, it was then worked with a half-loaded skip (sometimes even less). 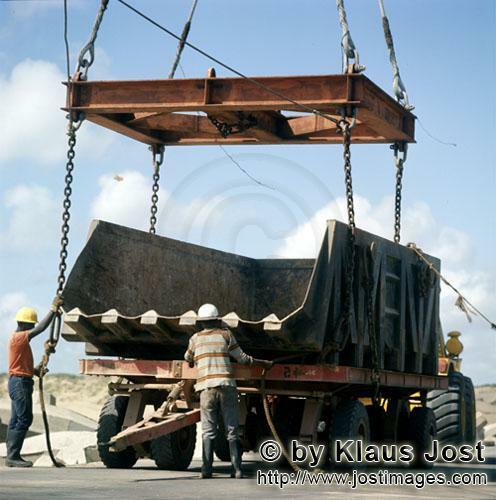 The feeding of the loaded stone skips was carried out with special platform trailers. They had a drawbar at each end and were able to drive in both directions without turning on the breakwater. The trailers were pulled by 160 PS tractors. The skips were loaded with the wheel loader Caterpillar 988 at the stone storage area. Via a monitor in the Manitowoc crane driver’s cabin the crane driver could position the skip and then dump the contents. When the prior known amount of stones was laid at the corresponding wave breaker position, sounding was carried out likewise with the Manitowoc 4600. The missing stones were then laid correspondingly and adjusted to high stone filling with the polyp. The surface of the stone filling lay at 3.0 m above tidal low water, fully exposed to the waves. Therefore the Manitowoc had to drive on the concrete head, which was always built simultaneously. By storm and extreme sea conditions the crane had to drive back into the area protected by the dolosse.